← Piper’s Kilt – There’s an Eastchester? Yes, it’s just East of Westchester. 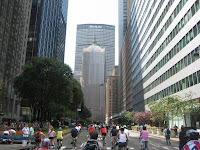 On the first 3 Saturdays in August, Park Avenue in NYC is shut down to motor vehicles. 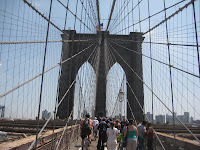 It’s called Summer Streets and allows people to walk, cycle, skate, etc from the Brooklyn Bridge to Central Park and back. 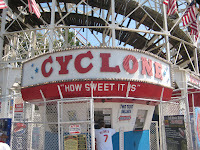 When I tried to plan our annual bike ride to Coney Island, Nona suggested we add the SummerStreets ride to the route. 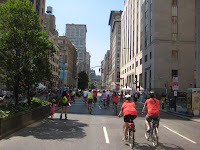 As we rode down Park towards the Bridge, the sweet smell of burgers filled my nose as we passed Spring Street in Soho. It was Soho Park. Nona said it was pretty good and when a few blocks later Bram got a flat, I suggested we pop in while he got it fixed. Soho Park has large garage doors that open on all sides, save the outdoor patio which they open wide to give this place an airy and open feel. 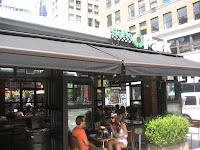 They offer all kinds of sandwiches, sides and drink menu that focuses on locally made wines and beers. 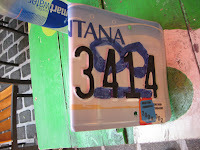 All orders come with a used car license plate bent in half with a number scrawled on it. This allows servers to find you once your order is ready. 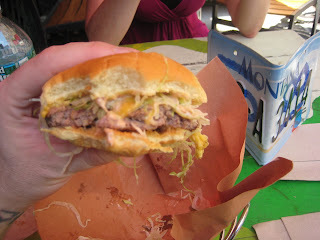 With the sun in my eyes, the wind in my hair and the smell of juicy burgers in my nostrils, I couldn’t wait to bite into this 6oz burger. The first bite left me confused. There was a taste I could not place. I bit in again. 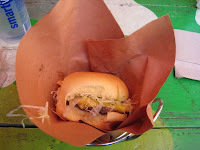 The soft potato bun was good and the sauce had a nice sweet yet savory flavor but something was off. It was the patty. It had a slight butane like flavor, like when you put meat on a charcoal grill before the butane is burnt off. But that wasn’t all. Another bite and I came to believe these patties were frozen. After an aroma that dragged me in like Pepe Le Pew to a perfume coated cat, I was let down. 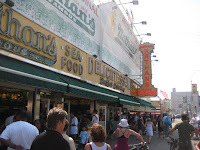 Thank god there was a delicious Nathan’s Famous grilled Hot Dog waiting for me in Coney Island! 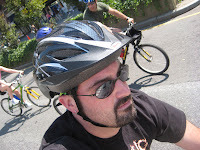 This entry was posted in Burgers, Hamburgers, New York and tagged best burger, bicycle rides, bike, burger conquest, cheese, ciancio, coney island, cyclone, david, french fries, hamburger, nathans, nyc, patio, restaurant, rev, review, soho park, summer streets. Bookmark the permalink. I apologize for the bad burger. I swear when I went there with 15 coworkers before the Gay Blades at the Knitting Factory the burgers were good. I swear. thank goodness for my Nathan's corn dog, it saved the day.